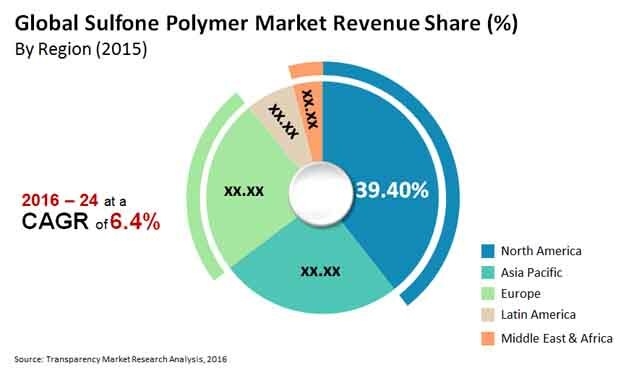 The competitive landscape of the global market for sulfone polymers features the dominance of BASF SE and Solvay S.A., which collectively held a massive 80% of the overall market in 2015, states Transparency Market Research (TMR) in a recent report. The report also states that the global demand for sulfone polymers is rapidly outstripping supply, indicative of the vast growth opportunities for established as well as new vendors to expand their production capacities and enhance distribution channels in the sulfone polymers market. In a bid to exploit the opportunity, top vendors in the market are forming strategic alliances with established distributors of sulfone polymers. A recent instance of this would be the agreement between Solvay Specialty Polymers and Biesterfeld Plastic GmbH in 2015. Under this agreement, Biesterfeld Plastic will distribute Solvay’s sulfone polymers in Finland and Scandinavia. Transparency Market Research states that the global market for sulfone polymers will exhibit a healthy 6.4% CAGR over the period between 2016 and 2024 and rise from a valuation of US$805.4 mn in 2015 to US$1,394.7 mn by 2024. Of the key applications of sulfone polymers, the report presents an overview of applications across sectors such as industrial, automotive, medical, aerospace, electrical and electronics, consumer goods, and military. Applications of sulfone polymer in the automotive industry accounted for a 24% of the global sulfone polymer market in 2015. The automotive industry is presently the leading contributor of revenue to the global sulfone polymer market and is expected to play a key role in the overall development of the market in the next few years as well. From a geographical standpoint, the market for sulfone polymer in North America leads, accounting for over 39% in terms of revenue of the global sulfone polymers market in 2015. Although the North America market, similar to the Europe sulfone polymer market, is expected to exhibit growth at a moderate pace over the report’s forecast period, it will continue to dominate. High Usage of Sulfone Polymers in Medical Industry to Continue to Remain Key Driving Force Usage of sulfone polymers in the medical industry accounts for a significant share in the revenue of the global sulfone polymers market. Owing to higher levels of corrosion- and wear-resistance, a variety of sulfone polymers have started to replace metals in implants and medical devices. With the rising demand for implants and several surgeries from the world’s rapidly ageing population, the market for sulfone polymers is expected to significantly benefit from the thriving market for medical devices and implants in the next few years. The use of sulfone polymers, especially across applications in the medical and aerospace industries, requires approvals from a number of regulatory bodies. This factor comes across as a significant challenge as regulatory bodies across different countries have vastly differing sets of approval procedures and stages. The delay in gaining the necessary approvals for marketing products could lead to restricting growth prospects. These factors could also restrict the usage of sulfone polymers in products that come in contact with food products such as baby product bottles owing to the concern regarding the potential leakage of bisphenol monomers into the food products. Bisphenol monomers have been known to have disrupting effects on the endocrine systems of consumers.